Hello! Happy Monday! One of my favorite things about weekends is breakfast. Weekend breakfast is special because the six of us get to sit at the breakfast table together. We aren’t rushing around trying to get out the door. Weekend breakfast means sitting around the table in our pajamas with the kiddos just in their undies 🙂 Hey, it is the weekend, anything goes. 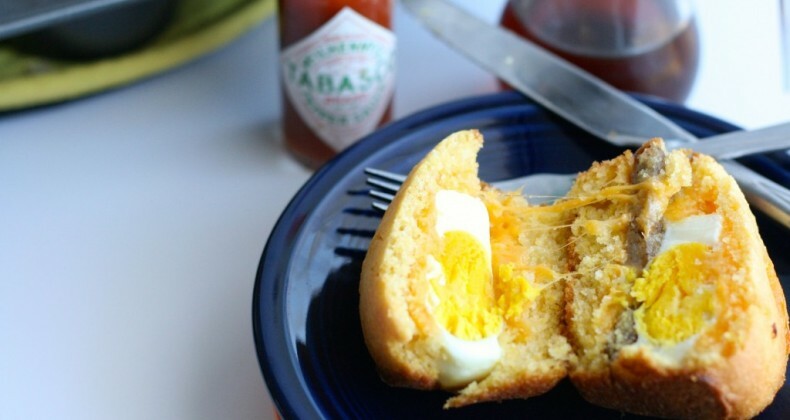 Last weekend my neighbor stopped by with a couple of these Cornbread Breakfast Muffins (yeah, my neighbors are pretty awesome) which my kiddos gobbled up quickly. I didn’t get to try them. So when Saturday rolled around I knew exactly what I was making for breakfast. They. Were. Awesome. Amazingly I had everything on hand to make them. You could make your own cornbread but I just used a premixed boxed version. Sausage patties, cheddar cheese, and farm fresh eggs (yeah, we have awesome friends who raise chickens) made this breakfast sandwich dynamite. 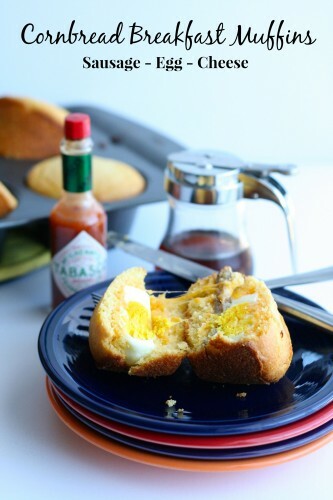 The cornbread muffins get slightly crispy on the outside, the egg yolk is hard but not dry, the cheese and sausage just add to the overall flavor. 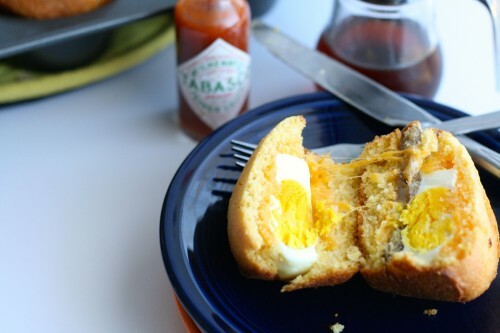 Drizzle on a little maple syrup or a splash of hot sauce and you have yourself a delicious breakfast. I thought these muffins reheated well with a quick zap in the microwave. So even though it isn’t Saturday you could still bake some tonight and reheat tomorrow morning. If using a 12 cup muffin tin fill the remaining muffin cups half way with water. Be careful when removing from oven because the water will be extremely hot! 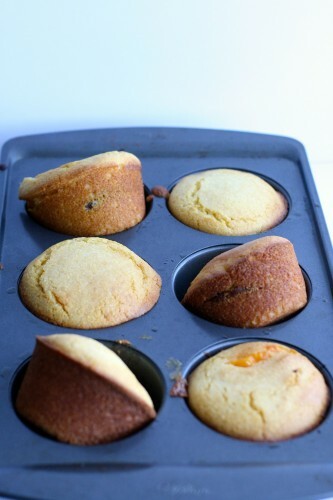 Grease a 6 cup muffin tin, crack 1 egg into each prepared cup. Bake for 20 minutes. Once eggs are done baking preheat oven to 400 degrees F.
Grease a 6 cup jumbo muffin tin. Pour 1/12 the cornbread mixture into each cup. Top with 1/2 slice of cheese, 1 sausage patty, 1/2 slice of cheese, cooked egg, 1/2 slice of cheese, and 1/6 of remaining cornbread mixture. Repeat with for the rest of the muffin cups. Bake for 20 minutes. Allow to cool 3 minutes in muffin tin before removing and serving. I must admit I love that there is Tabasco in the background. 🙂 Cornbread muffins are my favorite. I hope you give these a try. They make a special breakfast treat!